The Pogo Drive, Pogo Alert and Pogo Alert+ Driver Safety and Information Systems were the most technologically advanced products on the market. Since discontinued, the range is no more and the Pogo brand name is now owned by competitor Road Angel. The Pogo range provided the driver with a comprehensive range of speed management information in a user friendly format, the breadth and depth of which no other single system can provide. The Pogo Alert takes the technological advances made in the Origin b2 (pictured right) and yet again pushes the boundaries, adding a full colour 1.8-inch TFT LCD screen, all new menu-driven operating system, clear voice alerts, infra-red laser detector and plug-and-play portability. Pogo Alert will confidently warn motorists of approaching speed cameras, accident blackspots, schools, congestion charge zones, mobile police laser traps and safety camera vans. 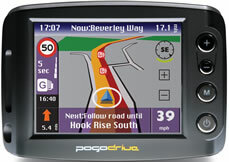 Pogo Drive does everything the Pogo Alert (pictured left) does, but also provides an advanced high quality 3.5-inch TFT colour touch-screen providing detailed street-level navigation with 2D or 3D map views and turn-by-turn voice guidance of Great Britain and coverage of major European roads. 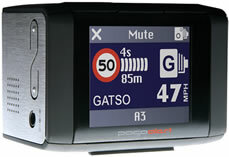 The Pogo Drive also features a dedicated speed camera only mode, warning simply to speed cameras. When in proximity of a hazard both products have high resolution screens with enhanced graphics showing: direction of vehicle travel, vehicle speed, speed limit, type of hazard, road number and a progress bar with a countdown to the hazard in meters and seconds. Verbal warnings are issued immediately stating hazard type and road speed limit. 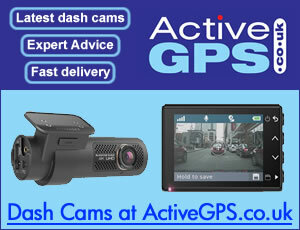 All Pogo GPS products benefited from having the Origin360 Speed Camera Database pre-loaded at the time of purchase. The Origin360 speed camera database was the longest established and most comprehensive UK speed camera database available. The speed at which the Origin360 team works is impressive. For instance, the target for adding new camera sites to the database is just 48hours; most, however, are logged and updated within 24 hours. The Origin360 database currently covers the UK and the Republic of Ireland. A database covering other European countries is currently under development. 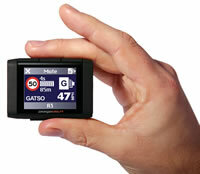 The PogoGPS product range was supplied with a free 6-month data download subscription. After this free period has elapsed, an annual subscription charge of £50 (including VAT) applies. Pogo Alert is the latest GPS speed camera detector (released in March 2007) and is the most sophisticated camera detector to own and use on UK roads. Pogo Alert is the spiritual successor to the multi-award winning Origin b2. The Pogo Alert takes the technological advances made in the Origin b2 and yet again pushes the boundaries, adding a full colour 1.8-inch TFT LCD screen, all new menu-driven operating system, clear voice alerts and plug-and-play portability. The Pogo Alert warns motorists of approaching speed cameras, accident blackspots, schools and congestion charge zones. In addition, alerts are provided for mobile laser traps via the supplied (removable) Pogo Alert infra-red laser detector module. Auto Express September 2007: The Pogo Alert speed trap proximity warning is user definable from 200metres to 2000metres or from 5-30 seconds. Voice warning of camera type/speed limit is provided when in the vicinity of a speed camera. Auto mute setting with adjustable "muted" volume is also available. Pogo Drive features high quality 3.5-inch TFT colour touch screen navigation with pop-up speed camera warnings. Detailed street-level mapping of Great Britain and coverage of major European roads with full 7-digit postcode search, 2D or 3D map views and turn-by-turn voice guidance are also provided with the Pogo Drive. As you approach a fixed speed camera, Pogo Drive will provide a countdown, starting at a specified distance/time before the hazard, and a spoken reminder of the prevailing speed limit. The Pogo Drive provides directional feature that alerts to speed cameras only if warning is applicable to your direction of travel and limitator feature that warns only if travelling over the prevailing speed limit.